If your wheels are incorrectly aligned this can dramatically affect the wear and tear on your vehicle’s tyres. Precise four wheel alignment will improve the wear of your tyres, increase their lifespan and performance, and save on fuel consumption. You will also benefit from improved handling and driving safety by reducing steering and stability problems. Go further on less fuel, and extend the life of your tyres by bringing your vehicle to Cowley Road Tyres. 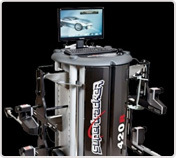 We have invested in the latest award winning Supertracker STR 420R wheel alignment. This new technology means less waiting time for you! Cowley Road Tyres has the latest balancing equipment which allows wheels to be balanced with great accuracy, to the nearest gram and we can balance wheels up to and including 24" in diameter.